Dogs will howl for different reasons but howling is thought to always be a form of communication. Howling is a normal vocalization that wild dogs often make but it isn't exclusive to just coyotes and wolves. All breeds of dogs, even a little Pomeranian or a Chihuahua, have the ability to howl, but certain breeds are more well known for making this sound. Sometimes a howl is done out of fear, due to pain, from disorientation after waking up from anesthesia, or simply to make their presence known. It's important to know what your dog may be trying to communicate to you when they are howling. Since a dog may howl if they are sick or hurt, howling can be an indication of pain from a sudden injury, abdominal discomfort, or another type of ailment. Canine cognitive dysfunction, sometimes referred to as dog dementia, is a medical issue that affects a dog's brain and can also cause a dog to howl. This issue is seen in older dogs and is similar to Alzheimer's in people. Dogs with canine cognitive dysfunction are often disorientated, confused, and act as though they don't know to go outside to do their business, which side of the door opens, or get around furniture in the house. This dysfunction is a neurological issue and since a dog may be confused, it may start howling just to hear itself or because it is confused or scared. 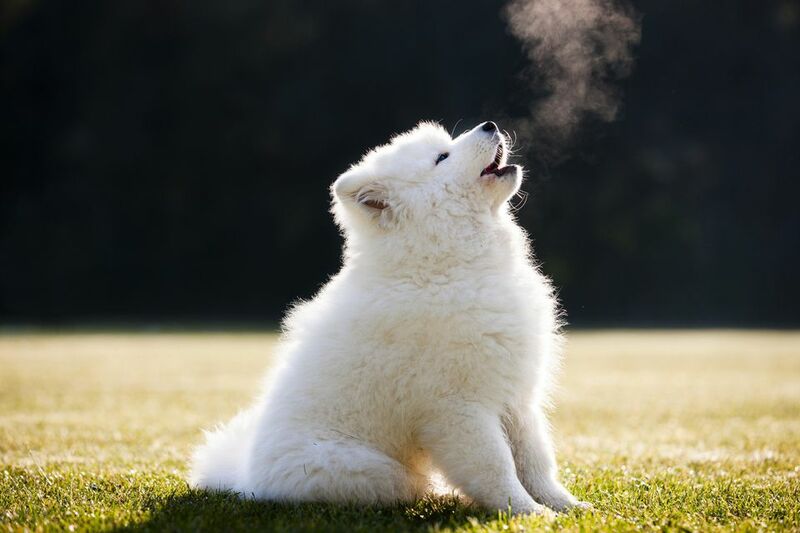 If you are concerned that your dog may be howling because of a medical concern, it is important to get it checked out by a veterinarian as soon as possible. Just like a dog who is howling out of a confused state of fear due to canine cognitive dysfunction, dogs who are in other fearful situations may howl. Extremely scared puppies may let out a howl if they fear for their lives or a stray dog who is scared may howl as it is trying to be caught by some good Samaritans. But regardless of the cause of the fear, if a dog is howling and in a situation that could be interpreted as scary, it is sadly a good indication that they are terrified. Happy, excited, or relaxed dogs do not typically howl. Canine behavior has been studied greatly and while we are still learning how to best communicate with dogs, we do know that sometimes howling is an indication of a behavioral problem. Dogs who have separation anxiety are commonly noted by neighbors to be howling while their owners are away, causing a noisy display. Unfortunately, dogs with separation anxiety and other forms of behavioral concerns are usually anxious and stressed so they howl for help or to get their owner's attention. If you leave your dog at home and hear howling when you step out of the door, it's a good sign that your dog may be stressed, scared, and have separation anxiety. Separation anxiety usually involves other things along with howling, like destructive behavior, pacing, or clawing at a cage or door. Thankfully, there are things you can do to ease this anxiety and the howling behavior that is often associated with it, but it will take time, training, and sometimes the use of pheromones, supplements, drugs, and other training aids. You may have a dog that howls when it hears a siren or other loud noise. This is most likely because your dog thinks the noise is actually a howl from another dog and howling can be a bonding activity or form of communication from dog to dog. If one dog starts howling then another dog will most likely start howling if there is one within earshot. Litters of puppies, such as Siberian huskies, are often seen showing off this natural instinct of howling as a group. In addition to dogs experiencing separation anxiety that howl, other dogs without this behavioral concern may also howl to get your attention. Some dogs are naturally more vocal than others, and since all dogs have different personalities, you may have a dog who likes to howl. Howling at a person to garner attention can mean "stay away" if the dog is protecting someone or something but it can also just mean "come play" if its your dog or another friendly canine who wants your attention.